The debate on gender communication is as old as time. 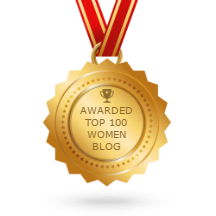 But is what men say more important than what women say? 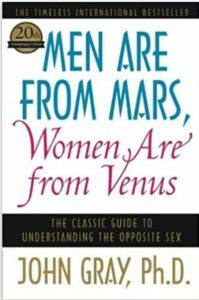 John Gray, Ph.D. first brought the differences to our attention in his popular book Men are from Mars, Women are From Venus. Dr. John Gray provides a practical and proven way for men and women to improve their communication by acknowledging the differences between their needs, desires, and behaviors. No other relationship guide on the market will give you the same level of evidence-based insight sure to help you strengthen and nurture your relationships for years to come. The main bullet point of this book is that women need to walk on eggshells and tiptoe around their men, for fear of upsetting them in some way. 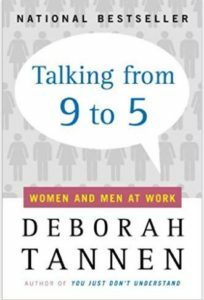 Gray’s book was followed up by a non-fiction business book from Deborah Tannen entitled Talking 9 to 5. Talking From 9 to 5 brilliantly explains women’s and men’s conversational rituals–and the language barriers we unintentionally erect in the business world. It is a unique and invaluable guide to recognizing the verbal power games and miscommunications that cause good work to be underappreciated or go unnoticed–an essential tool for promoting more positive and productive professional relationships among men and women. As a working woman, reading this book gave me an advantage. After reading it, I find myself using a different communication style now with males at work than I do with females at work. At least now I am aware of how the “female” communication style I naturally use is probably being heard by my male superiors. Clearly, there are different ways that men and women communicate and also different ways that we “hear” what is being said depending on our gender. So how do we combat those differences so that we can be effective at work? The first thing I recommend is that you do a little reading to understand how certain words and body language are perceived. It isn’t true that what men say is more important, however, when they deliver their message with confidence, it can be perceived as more valuable. Let’s focus on the weaknesses, or rather, the opportunities we have to improve our communication delivery. Be aware of unconscious stereotypes and biases and be open to breaking past them in order to leverage each other’s strengths. Get comfortable asserting more space for yourself. When dealing with men in decision making, try to stop yourself from processing out loud. If you do process out loud, let the man know that this is a process you use for decision making and you are not asking him what to do. Women and men do tend to communicate differently, however, that doesn’t mean that what one gender has to say has more value. If your desire is to have your voice heard, you need to be aware of the fact that men hear and perceive what women say differently from how women respond. Listen closely to the words used by men in your next meeting. Watch the body language as women and men share their opinions. Is there a difference? The next time you offer a suggestion that is ignored but a man says the same thing and the room stands and applauds, honestly examine the differences in how the same idea was presented. Once we’re aware and begin to practice delivering our words with authority and confidence, we will begin to be taken more seriously.